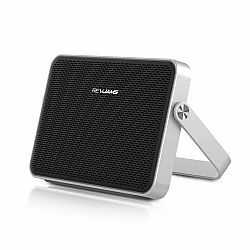 The RevJams Razor Bluetooth portable speaker offers super rich sound a sleek aluminum slim design and over 8 hours of play time. Great sound makes everything better! Turn your day trip into a disco, make your picnic a party, listen while you work, boogie on the beach, and bring crisp, clear sound wherever you go. Aluminum slim/sleek low profile design plus a rugged water resistant solution make the RevJams Razor the perfect lightweight, portable speaker solution.